Oh my. 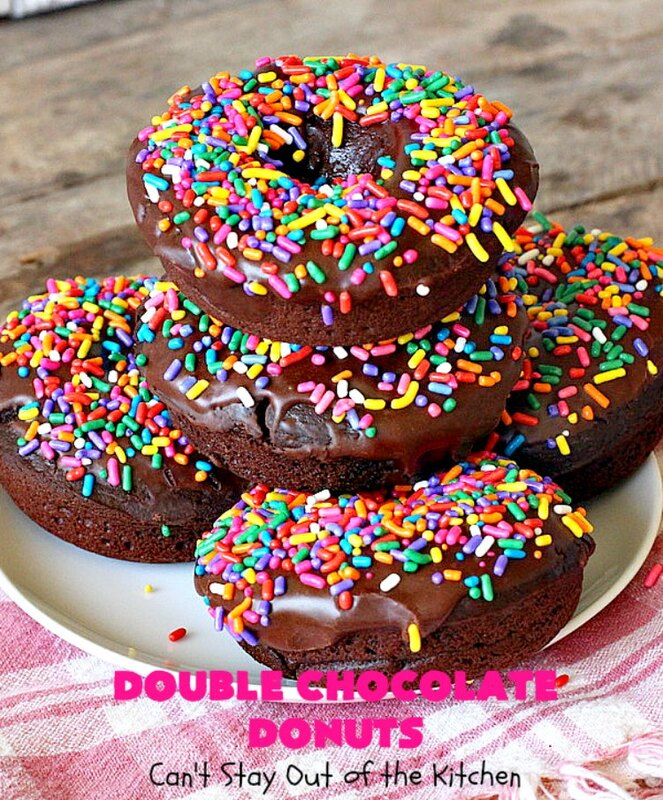 Double Chocolate Donuts. Yes, these donuts are utterly spectacular. 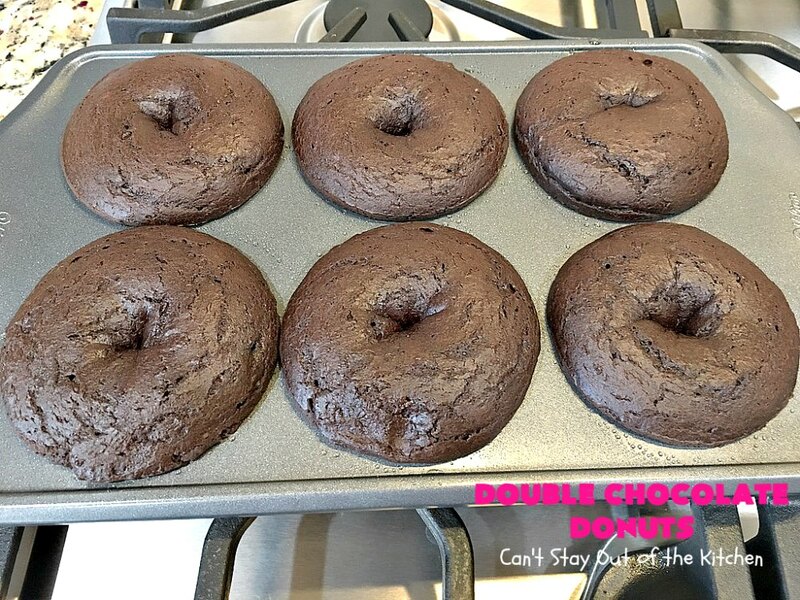 They are thick, chocolaty and oh, so heavenly. 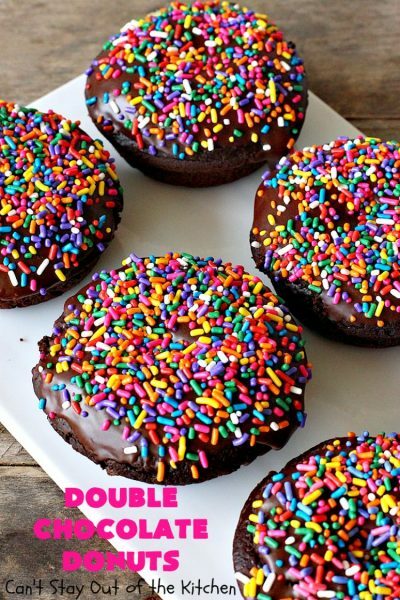 Plus, they’re topped with a luscious chocolate icing and sprinkles. 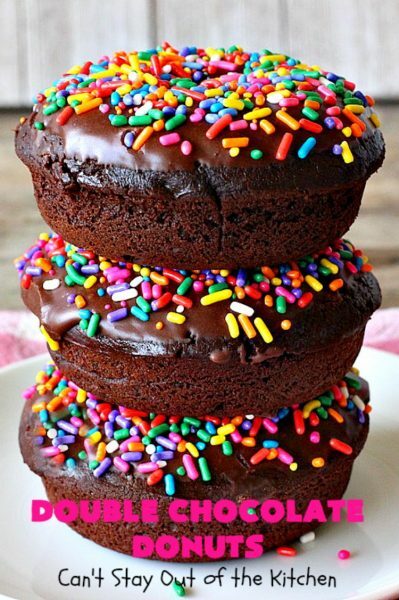 It’s hard for me to turn down anything with sprinkles. 🙂 But having a double dose of chocolate is a girl’s best friend. Yum. 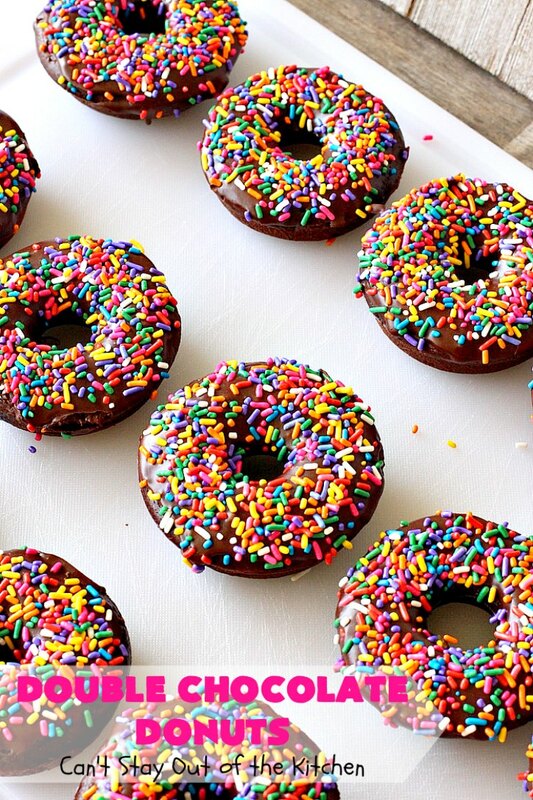 Donuts are one of my favorite foods. 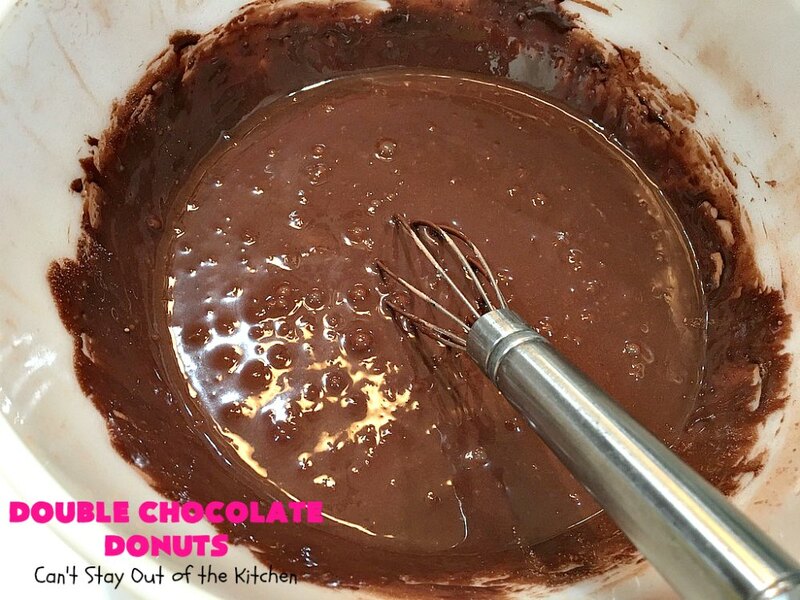 Ever since I was a child when my Mom used to make homemade donuts on Saturday nights, I’ve loved donuts. She would fry, fry, fry until all the donuts were done. 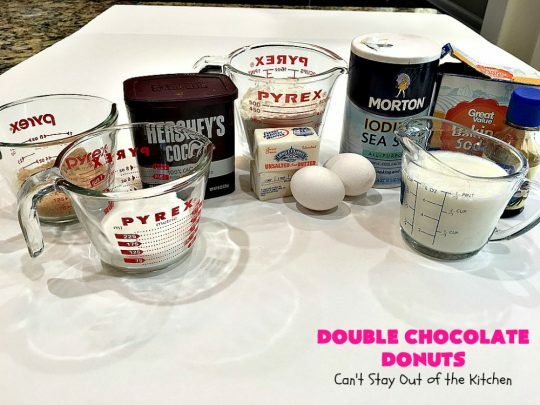 Then she glazed them with chocolate or vanilla icing. Sometimes she rolled them in cinnamon sugar or powdered sugar. On those rare occasions when there were actually leftovers, we had them the next morning for breakfast. So mouthwatering. A couple of weeks ago, our church hosted the youth in our church for a weekend of fun, music and Bible study. Kids were put in groups by age into different host homes. 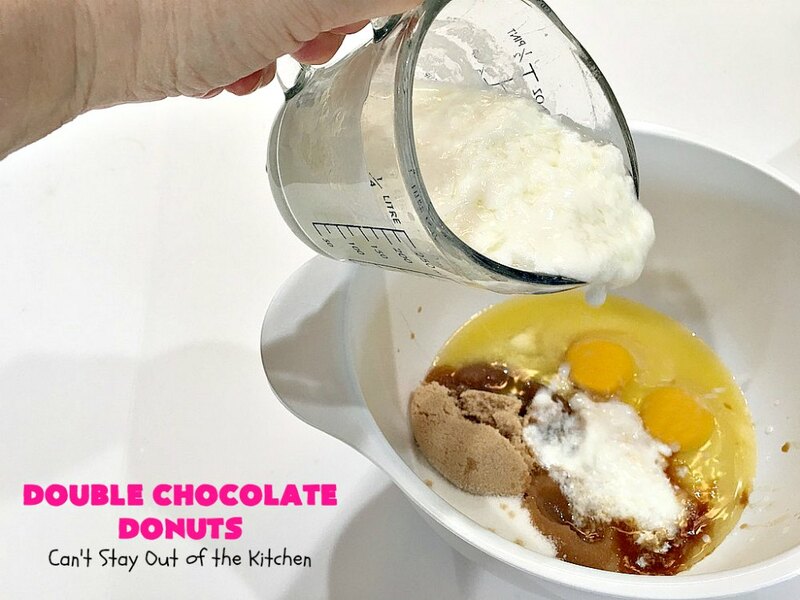 I made these delightful donuts for a Sunday morning breakfast. (I made the Baked Vanilla Donuts for Saturday breakfast). I had fun making these donuts. I especially enjoyed dipping them in the icing and sprinkling the sprinkles on top. Yes, I’m a kid at heart. I made two double batches of these donuts. 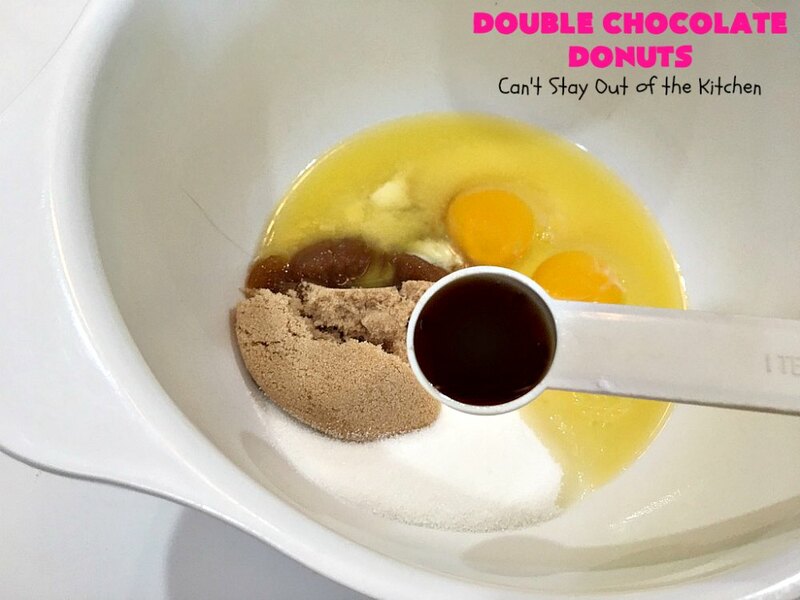 When I realized that a single batch only made about 4-5 donuts, I knew I needed to make up more. The first batch I forgot to double the buttermilk (I used sour milk). I actually liked that batch better. It was thicker in texture and probably a little heavier, but I liked it the best. The second batch I doubled the sour milk (like I was supposed to). I thought the dough was way too runny and certainly not something you could pipe out of a zip-lock bag. The donuts may have turned out lighter in texture this way. 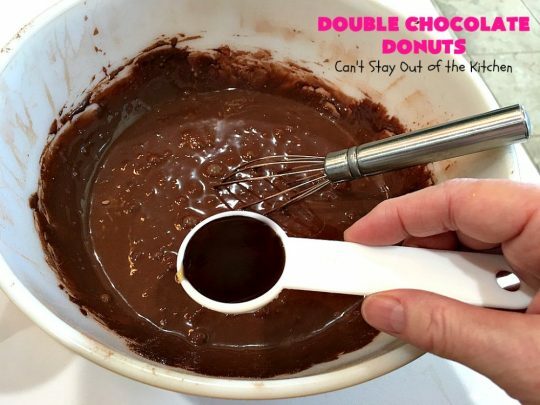 But the ingredients would have to be carefully spooned into the donut cavities of the pan I was using. That was a little more work than I really intended when I began the project. We loved Double Chocolate Donuts. 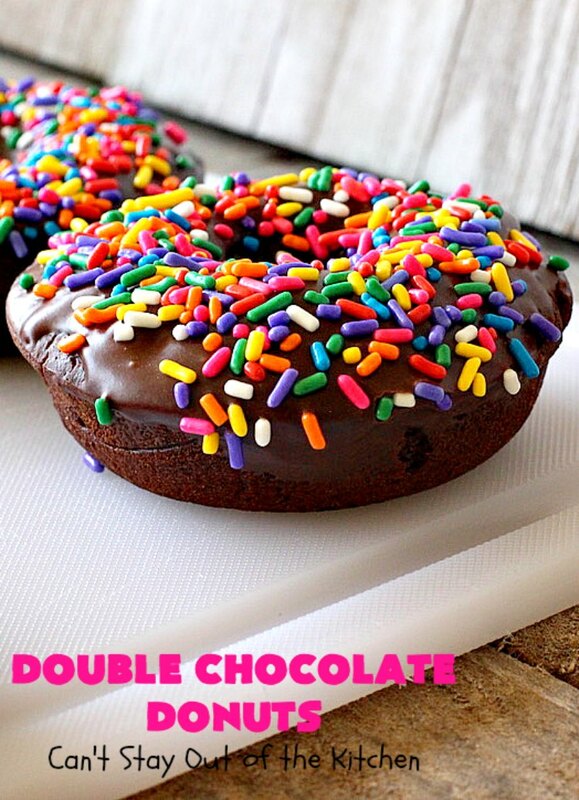 The double dose of chocolate makes these donuts spectacular. 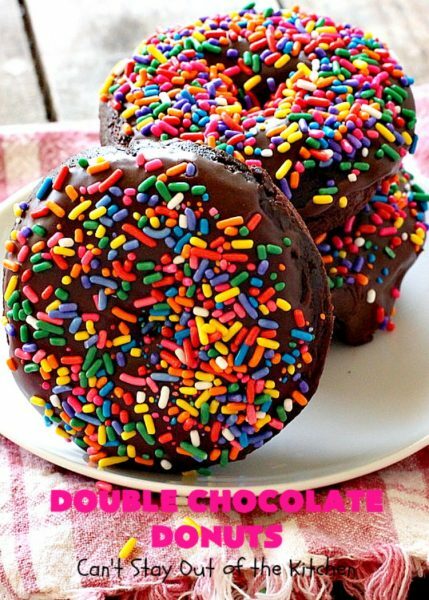 Double Chocolate Donuts are quite substantial. You will probably find yourself quite full after eating only one donut! I used these ingredients for the donuts. Place UNBLEACHED all-purpose flour in a mixing bowl. Bleached flour toughens baked goods. Add cocoa, salt and baking soda. In a separate mixing bowl, melt and cool butter. Add sugar, brown sugar, vanilla and eggs. Add soured milk or buttermilk. Add the dry ingredients to the bowl with wet ingredients. Whisk ingredients to combine. 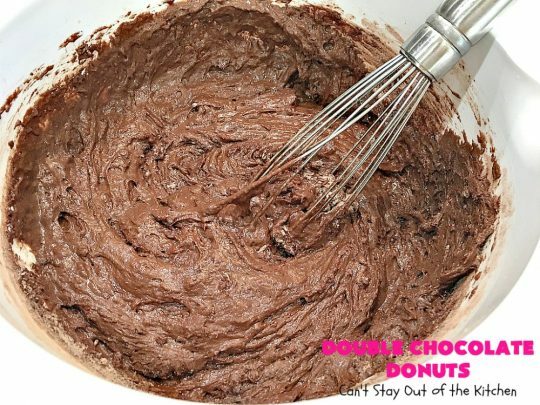 Be careful NOT to overmix the batter. 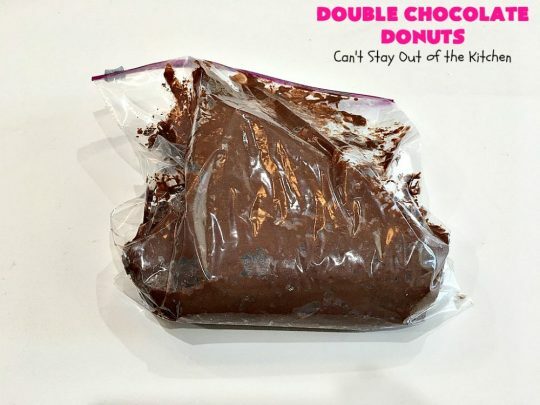 Spoon dough into a zip lock bag. Cut off one corner. 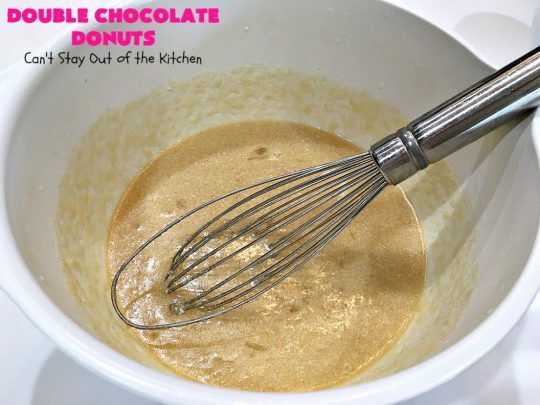 Spray donut cavities well with cooking spray. 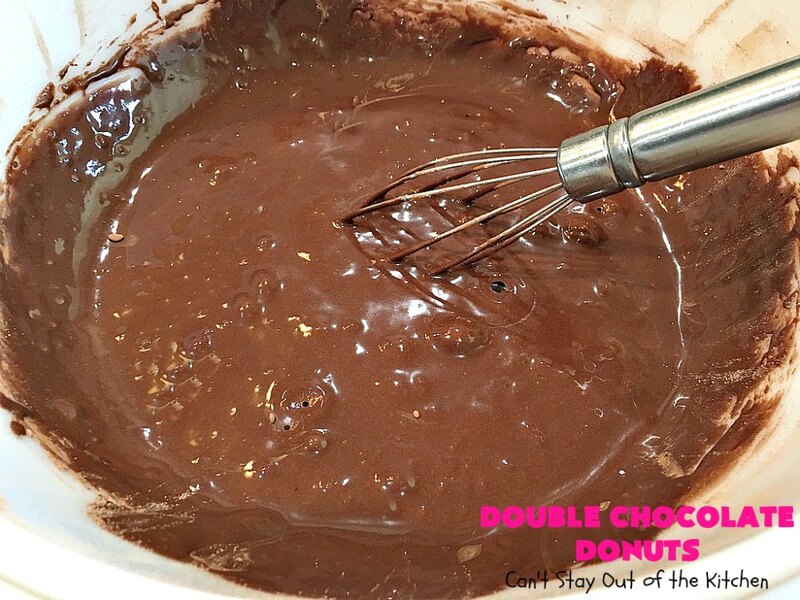 Pipe batter into donut cavities. These are probably a little too full but I liked them bigger. Bake at 350 for about 8-10 minutes. My donuts took about 13 minutes because they were larger and filled to fuller capacity. Allow donuts to cool about 5 minutes before removing from pan and placing on cooling racks. 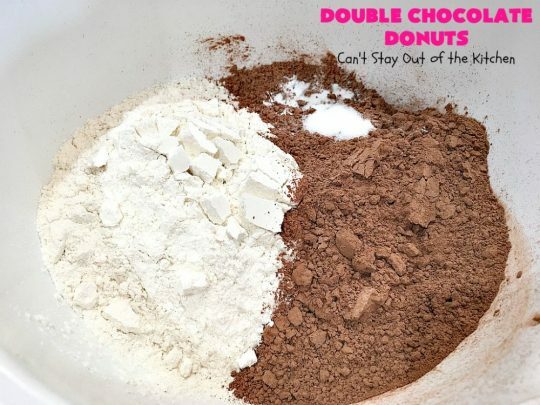 Combine powdered sugar, cocoa and part of the half and half in a mixing bowl. Add either dark or light corn syrup and remaining half-and-half. Dip cooled donuts into icing. 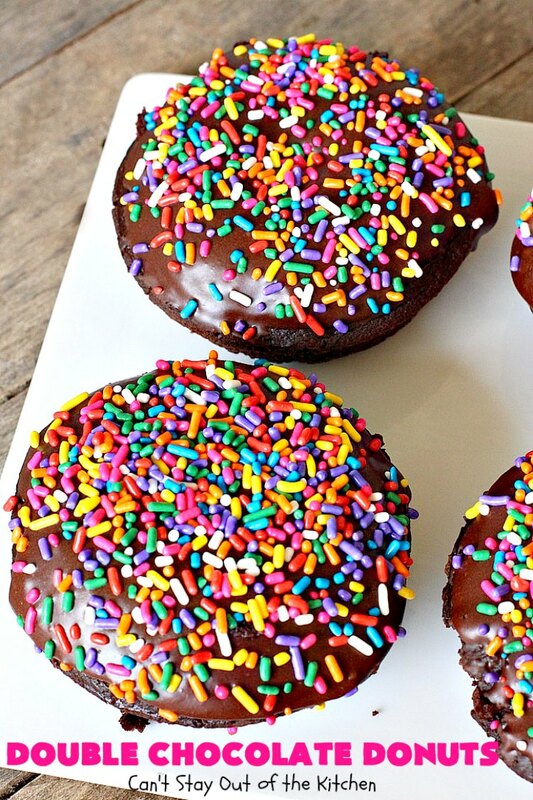 Immediately sprinkle the tops with sprinkles. 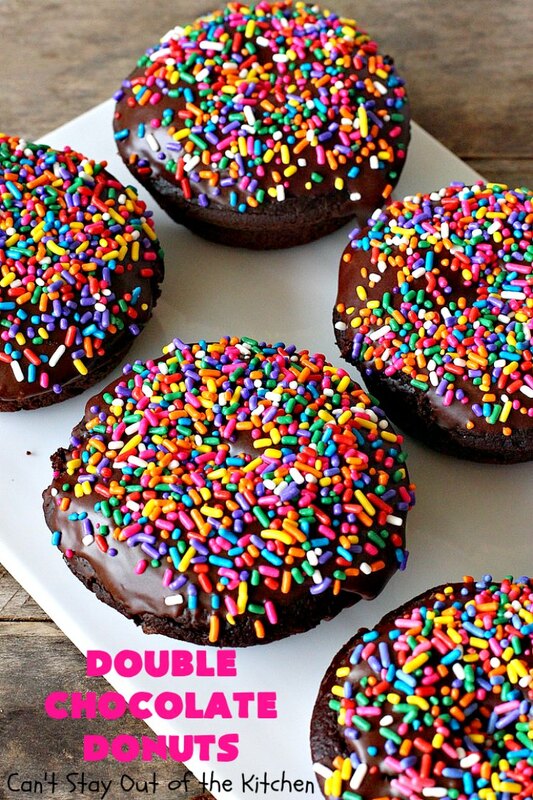 (If you wait too long the icing dries and the sprinkles won’t stick to the icing). 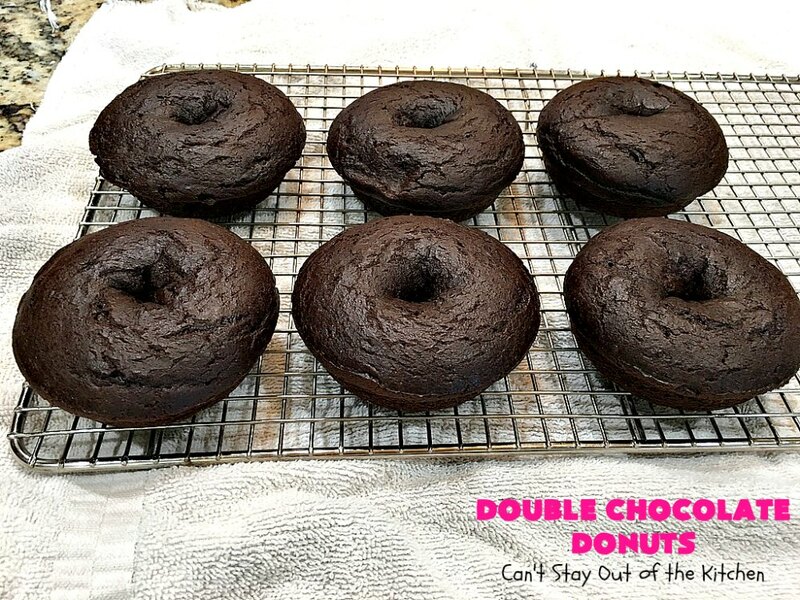 Double Chocolate Donuts are the perfect breakfast idea for holiday or birthday breakfasts! 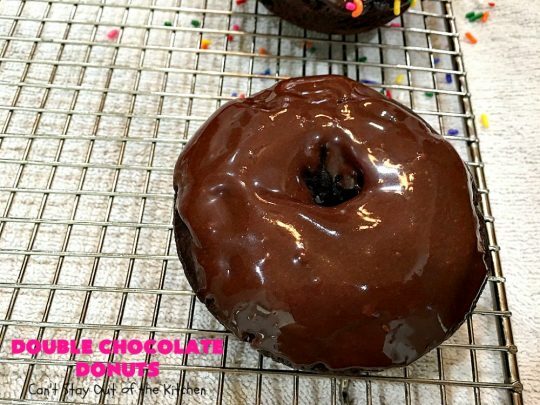 If you enjoy chocolate donuts, you’ll love this version. 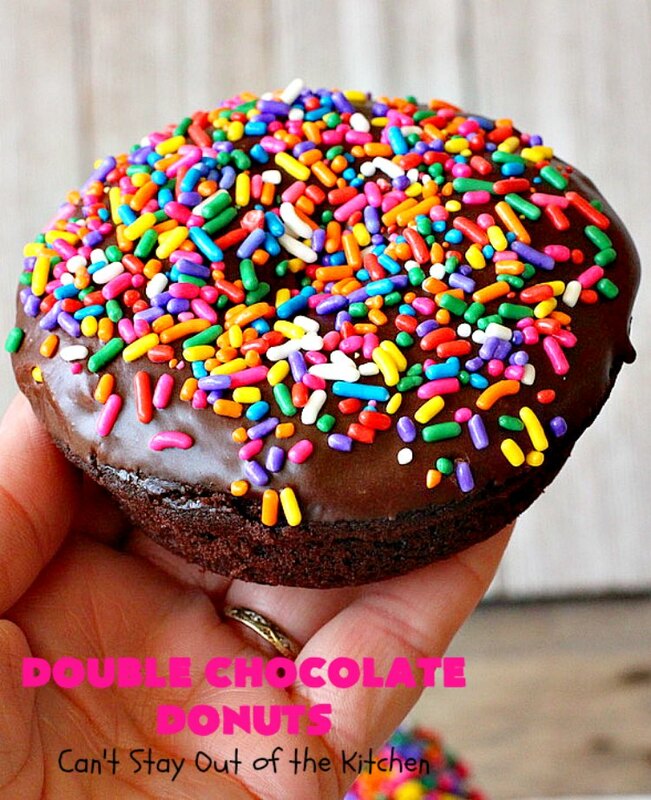 Double Chocolate Donuts are absolutely mouthwatering. These spectacular donuts are terrific for holiday breakfasts like Thanksgiving, Christmas or New Year's Day. 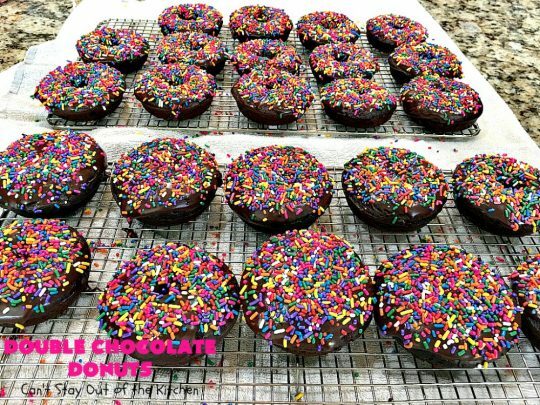 If you enjoy homemade donuts, these chocolate donuts with chocolate icing and sprinkles are heavenly. Spray a 6-cavity doughnut pan with cooking spray. In a medium mixing bowl whisk flour, cocoa, baking soda and salt. In a separate medium-sized bowl, whisk the melted and cooled butter, egg, sugars, vanilla and buttermilk until thoroughly combined. Add the dry ingredients to the butter mixture. Whisk ingredients until combined, but DO NOT OVERBEAT. Spoon the batter into a ziplock bag. Cut off the bottom corner, then pipe the batter into the greased doughnut tin. Bake for 8-10 minutes at 350, until donut is set or a toothpick inserted in center comes out clean. If you lightly touch the doughnut, it should spring back. Allow doughnuts to cool in the pan for 5-10 minutes. 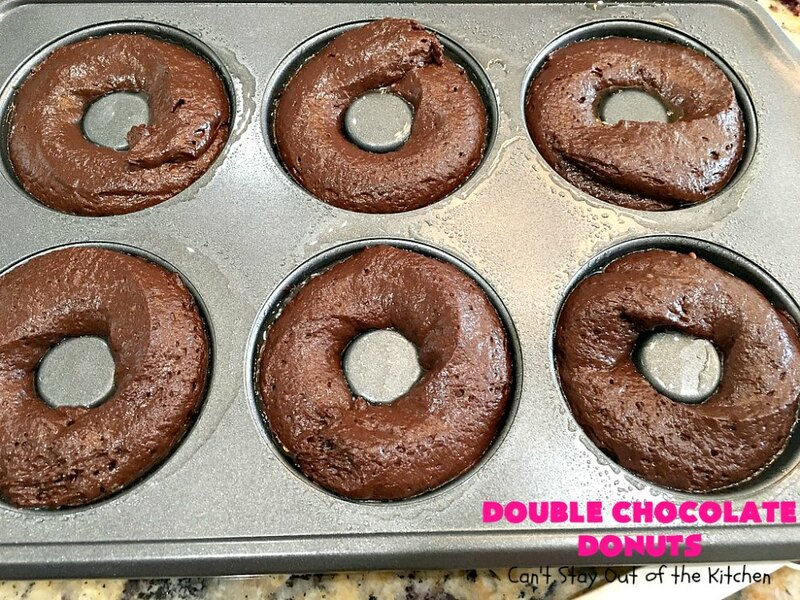 Remove from the donut pan and continue cooling donuts on a wire rack. While the doughnuts are cooling, make the glaze. 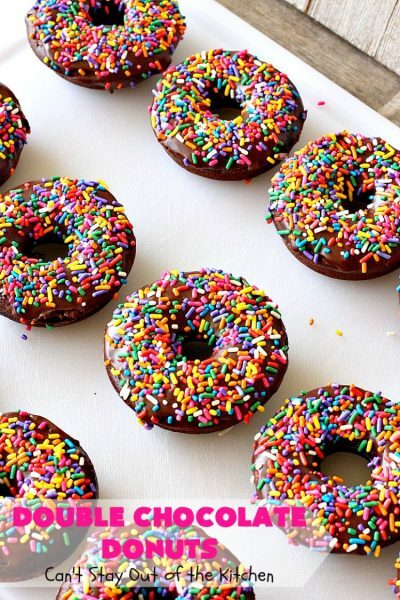 Dip donuts into glaze and immediately sprinkle with sprinkles so they adhere. 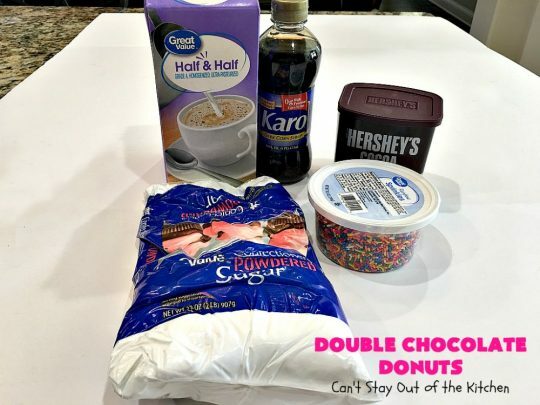 Whisk together powdered sugar, cocoa and about 2 tablespoons cream or one tablespoon half-and-half. Add corn syrup and stir. Slowly add the remaining cream or half-and-half until glaze is smooth. Once the doughnuts are cooled, dip the top of the donut in the chocolate glaze. Set on cooling rack and sprinkle immediately with sprinkles. 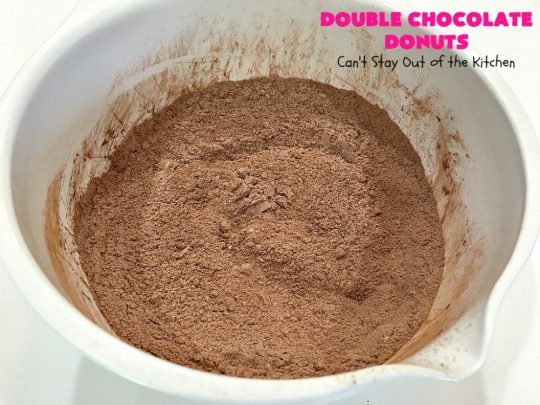 NOTE: A double batch makes about 9 donuts. NOTE: I tried this recipe using the original 2/3 cup buttermilk and then again using 1/3 cup buttermilk. I preferred using less buttermilk. The recipe was a lot thicker and puffed up better in the oven than using more buttermilk. NOTE: I found my donuts took about 13 minutes at 350°. Recipe adapted from Just So Tasty. Double Chocolate Donuts are absolutely delightful. 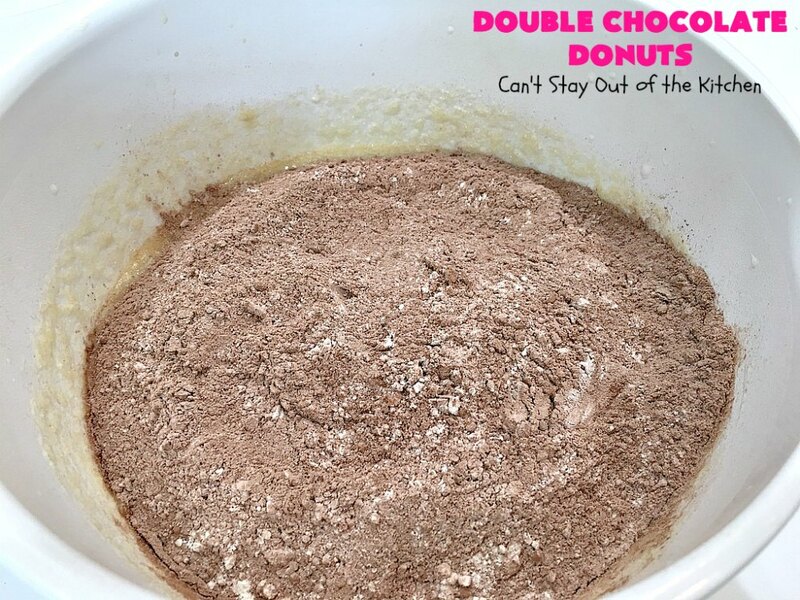 Bake up a batch of Double Chocolate Donuts for your next family breakfast. They’ll be wolfed down in no time. I made these yesterday and they were WONDERFUL!!! My husband loved them! Very chocolatey. It’s that a word? Another great recipe… Thank you! Hi, Shelly, I’m SOOOO glad you enjoyed the donuts. We thought they were fantastic too. Such a great treat for a holiday breakfast.